CHARLOTTE (WTVD) -- Carolina Panthers Josh Norman is auctioning off his military-style gloves and cleats for a good cause. He wore the gear during the win Nov. 8 against Green Bay. The game was part of the NFL's Salute to Service. All proceeds for the auction will go to a Warrior Reset program for military families in the Carolinas. Both items are signed by Norman and come with photos of him wearing them during the game and showing them off in the locker room, WSOC reports. The auction runs through Dec. 10. The NFL fined Norman $5,000 for wearing the cleats. 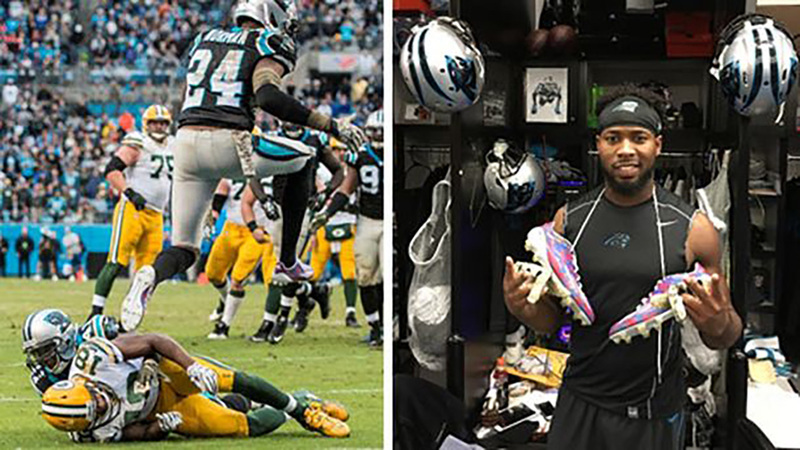 Norman said it was because of the words, "proud, brave" written on the cleats rather than the red, white, and blue colors which didn't meet the requirement of matching the Panthers' color scheme.